Please take our ten question multiple choice survey. Only your input will allow us to better serve you, our members. You can find the survey at this link, or by copying and pasting the address below. The 111th annual A&WMA conference will be held at the Connecticut Convention Center in Hartford, June 25-28. There will be four days of presentations, courses and events on a multitude of environmental topics including air quality, regulation, sustainability, waste, transportation, health effects, and climate change. Bill Wehrum, EPA Office of Air and Radiation Assistant Administrator, will give the keynote presentation, and there will also be 40 panels with state directors and commissioners, 250 technical presentations and 75 exhibits, among other highlights. For early bird pricing, please book by May 23. Find complete details and register HERE. The Rhode Island Society of Environmental Professionals is pleased to announce the availability of educational scholarships for the 2018 - 2019 academic year. Two scholarships will be awarded to a RISEP member enrolled in a degree program at an accredited New England College or University and a course of study that is consistent with becoming an Environmental Professional. A third scholarship will be awarded to a RISEP member attending a Rhode Island high school, who has demonstrated a commitment to improving environmental quality, and will be accepted into the Fall 2018 academic year at an accredited New England College or University. The purpose of these $1,000 scholarships is to recognize and support students engaged in environmental studies and programs in Rhode Island and the New England Region. The scholarships are intended to assist in pursuing educational requirements necessary to seek opportunity in professions within the environmental field. The scholarships will be awarded at the 2018 RISEP Annual Summer meeting. Applications must be submitted no later than March 31, 2018. Please email mmiller@rrlawpc.com for a copy of the application. We are pleased to announce that the SWEP ballot for Executive Committee members was unanimously approved! For a full list of current members, please see the Executive Committee page. 2017 was a fabulous year for women – and for our local SWEP Chapter! Our first Quarterly meeting (“MEET the DEEP”) gave us an opportunity to hear from the Bureau Chiefs (and a designee thereof) as to what is keeping them (and us) busy. Our next Quarterly (“Rags to Riches”) featured DEEP’s Ross Bunnell with a discussion of various waste handling and disposal issues. In August, we hosted our first “Tips from the Top” featuring three of our members that was so well received we are planning another with three new speakers in 2018. We concluded our year with a joint holiday party with EPOC in December! We awarded grants totaling $5,000 to three organizations: Envirothon, the Salmon River Watershed Association and Nathan Hale School. You can read more about these and all of our donations from years past on this website. 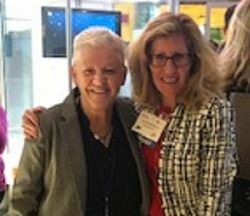 2018 promises to be an exciting year as well – to be kicked off by a Quarterly on March 22nd with former EPA Administrator and DEEP Commissioner Gina McCarthy! We are also beginning a mentoring program to connect emerging professionals to their more seasoned colleagues. Please join or continue your membership with this dynamic group that works to foster the development of women environmental professionals in Connecticut! At our winter 2016 Brownbag Lunch program, SWEP members and guests gave a total of 40 pounds of nonperishable foods that were donated to the Connecticut Food Bank. We thank you all for your generosity! Dress for Success accepts donations of lightly used business-appropriate clothing and accessories for women, including the following types of items: blouses, pant and skirt suits, dress jackets, dress pants, dress shoes, scarves, sweaters or sweater sets, jewelry, briefcases and handbags. Clothing and scarves must be on hangers, shoes and jewelry should be in boxes if possible, and all items must be clean. Please consider giving your closets a once-over for items that you no longer wear or need, that could be of use to others. This is also a good opportunity to contact recently-retired colleagues who may have business attire that they no longer need. Dress for Success is a 501(c)(3) nonprofit, so all donations are tax-deductible. Connecticut SWEP, Inc., acting as a conduit for the dispersal of funds belonging to the Connecticut Groundwater Association, recently gave a donation to the Connecticut Envirothon on behalf of CGA. The Connecticut Groundwater Association was a precursor to the Environmental Professionals Organization of Connecticut. The founder and champion of the CGA, Dennis Waslenchuk, recently passed away. Dennis and the CGA were also good friends and supporters of the Connecticut SWEP chapter over the years. SWEP's 2014 Holiday Brownbag Program was a big success! Guest speakers Sandy Breslin of Audubon CT, the Connecticut office of the National Audubon Society, and Liz Gemski of Murtha Cullina's environmental law team spoke to us about women in the environmental movement, local environmental advocacy, and upcoming challenges. SWEP members participated in a holiday raffle, and contributed support to local nonprofits. With member donations and matching amounts from CT-SWEP, we contributed a total of $770 to Audubon Connecticut, and $260 plus 20 pounds of nonperishable foods to Connecticut Food Bank. Thanks to all who attended the program, and thank you for your genorosity this holiday season!